The present city of Bangalore [Bengaluru] then was part of the Vijayanagar Empire. It is known that Kempe Gowda-I (1513-1569), the ruler of Yelahanka province, feudatory to the Vijayanagar rulers was instrumental in giving shape to this modern city. He had been a great builder of tanks and temples. He had planned the modern Bangalore [Bengaluru] and built it from 1527. Kempe Gowda I, who was in charge of Yelahanka, built a mud fort in 1537. With the help of King Achutaraya, he had built the little towns of Balepet, Cottonpet, and Chickpet, all inside the fort. Today, these little areas serve as the major wholesale and commercial market places in the city. It is customary that new cities used to be built by the rulers on the banks of some river. Incidentally, this city of Bangalore [Bengaluru] was also built on the banks of the river Vrishabhavathi and Paschmavahini. The river Virshabhavathi forms the western boundary of the Bangalore [Bengaluru] City. Today existences of these two rivers or the fort are not known to many. If you move from the city market on the Mysore road you will come across the sangam of these rivers. Old Bangaloriens will tell you that till about early sixties water was flowing through in the river Vrishabhavathi and today only industrial waste is flowing making it look more like gutter rather than river. 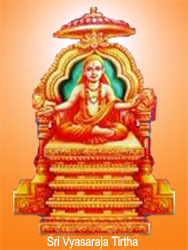 Sri Yatiraja born near the place Chennapatna on taking up the sanyasa came to be known by the name Sri Vyasaraya Tirtha. He is also known as Sri Vyasaraja Tirtha since Sri Krishnadevaraya had given away his rajya to this saint. He was Rajaguru of the Vijayanagar Empire. The Empire went from Saluvas to Thaulavas. But Sri Vyasaraya Tirtha remained the Rajaguru for these two dynasties. Sri Vyasaraja Tirtha a great philosopher and was devoted to Lord Anjaneya. He had built around 732 temples for the Lord. He had been frequenting areas around Mysore Chennapatna, (present) Bangalore during his time. It is said that there existed the idol of the Lord Anjaneya open to air (digambara temple), from more than eight hundred years back in the sangama of the river Vrishabhavathi and Paschmavahini. And during one of his visits Sri Vyasaraya Tirtha had performed punnar uddarnam of the Lord in the temple. In variant to this it also said that the idol of Lord Anjaneya had been installed by this saint. But with the river Vrishabhavathi as the western boundary it could be said that the Lord Anjaneya was at the entrance welcoming the guests to the province under the control of Sri Kampe Gowda I. Else it could be said that Lord Anjaneya had been protector of the province. Today this digambara temple had grown to be a big temple in the highly congested Mysore Road. 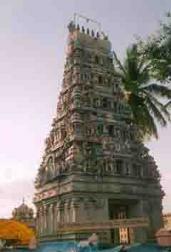 The tall rajagoupram of the temple will welcome the devotees. Have dharshan of Sri Genasha and Sri Venugopala in the rajagopuram. Once inside the temple compound one will forget all the hassle of the world outside and will be taken over by the tranquility of the atmosphere. Now with a quit mind, step in and have dharshan of Sri Rama patham and offer your prayers. Moving sideward you will enter the main temple, firstly have dharshan of Sri Rama parivara and Sri Satyanarayaswami. Sri Anjaneya Swami moolavar is seen facing the Sri Rama parivara. This temple is known to many devotees of the Lord Anjaneya in Bangalore by the name "Gali Anjaneya Gudi". Gali means air and Gudi means temple in Kannada language. This could mean two things firstly because Lord was in Digambara temple originally hence Gali Anjaneya. Secondly since he is son of wind God Vayu hence Gali Anjaneya (Vayu sutha:). The west facing Gali Anjaneya is smeared with sinduram (a saffron colored paste) which is considered aspious by Hindus. Probably this is the only ancient temple in south India where the Lord is smeared with this aspious paste of sinduram. 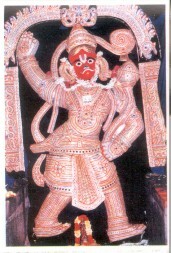 The tail (lankulam) is seen with lots of bents and rolled at the end, denoting that Lord here is santha swaroopi. There is a small bell tied to the tail which is the signature of Saint Vyasaraja related Anjaneya idols. The uniqueness of the Lord here is he has a mustache, and a yathurmuki ie, he is facing the devotees directly with both the eyes. The eyes are glowing with power of a saint and a guru and the devotee should be blessed with gyana through them. Lords' left hand is seen resting on the hip and holding the lotus flower. His right hand is in abhya mudra offering the quality of nirbhayathvam to all His devotees. While Lord is seen with all ornaments the small knife in the casing which adores His right hip as an ornament only adds beauty to the Lord who is Santha-gyana swaroopi. Bangalore is a place where there is no dearth of temple for the Lord Anjaneya. But this ancient Anjaneya temple is unique in many ways. Have dharshan of "yathurmuki-Santha-Gyana Swaroopi" Gali Anjaneya for all the blessings you need for the life.